Managing customer data effectively and securely will allow your business to offer more tailored and personalised experiences. For businesses today, mastering secure customer data management is a key driver to get digital right Managing customer data is critical to understanding each customer’s journey and history – from their path to purchase, buying patterns, customer service inquiries, preferred engagement platforms and more. Understanding this journey allows companies to improve and personalize future customer engagements, ultimately building lasting trust that can lead to customers for life. Further, in light of recent data breaches in the news (Facebook’s recent Cambridge Analytica scandal comes to mind), achieving secure customer data management, doing it well and building user trust is more important than ever to overall success in the digital landscape. While there isn’t a one-size-fits-all approach to acing customer data management, there are guidelines that any organization should follow when capturing, storing and analyzing this data. As the digital landscape continues to grow, so does the amount of data available to us. IDC estimates that by 2020, business transactions (including both B2B and B2C) via the internet will reach up to 450 billion per day – leading to an exponential increase in data. As companies implement more and more online initiatives to reach customers, it needs to be done with a specific focus in mind, or they will find themselves drowning in information that doesn’t necessarily bring value. Businesses need to first consider what it is they want to know and understand about their customers and their needs. Users can’t be guided to make an informed purchasing decision without businesses first understanding what it is they’re looking for, and what their end goal is. Not only will capturing this data help potentially close individual sales, but businesses can analyze large batches of customer data sets, looking for patterns at an aggregate level about what their customer base prefers and how they engage. Ultimately, this provides a foundation for new innovations and processes, so that business models can be catered to what customers are looking for, rather than just what is already being delivered – in terms of both their online experience and services/products being offered. Data security should always be front and center for businesses dealing with any level of customer data. Security is paramount to not only protect customers’ data and save businesses from a PR nightmare, but to build their trust in a business’s ability to safely manage their data, showing them that the company is committed to fiercely protecting the information they share. Security is a difficult aspect in mastering proper management of customer data, but with so many users now online (2017 saw a reported 3.8 billion users online) and making digital purchases, it’s always a top priority. For example, customers aren’t interested in reinventing their own wheel every time they want to buy something online, so many will agree or opt-in to having a company keep their digital footprint in order to personalize future interactions. However, they need to be confident that their digital footprint is securely stored and protected. Providing transparency to customers in how businesses are securely storing and protecting their data enables businesses to win user trust and retain customers. Businesses should be proactive in showing customers that they have the necessary tools and security measures to keep data safe from breaches and malicious attacks. Just as much as it’s important to create a unified experience for customers on their buying journey, businesses should be creating a unified and centralized way to internally track and access that data cross-channel. Omnichannel solutions can quickly become fragmented to users if not managed well, so it’s important to capture key pieces of critical customer data and assess it regularly. This enables businesses to understand what customers need to buy and when, setting up opportunities to proactively present relevant offerings to current and prospective customers exactly where they are, and exactly when they need it. Databases and powerful analytics tools are critical to success here. Businesses need to stop relying on Excel spreadsheets and outdated systems. To get the best picture of a customers’ data and manage it well, businesses need to be where they are – online. Advancements in technology have led to data management tools that make it easier for everyday employees to engage and analyze complex data sets. This improves the employee experience, which in turn, results in better customer experiences, while also giving increased visibility into user activity and who the most valuable repeat customers are. To put it simply, internal departments cannot work in silos in the digital age. These barriers will keep companies from truly understanding the customer journey and will ultimately affect their ability to supply a unified experience for customers. Internal silos between departments can often add to channel confusion as well. Different departments should work together, using critical customer data to provide a digital offering that brings everything a customer would want to one central location. More importantly, customers should not have to go looking through a myriad of various websites to find what they want. Everything should connect, based on what you know about each unique customer, to bring them the best experience possible. 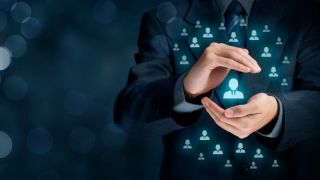 Everyone within an organization needs to be able to access and assess the relevant and necessary customer data being collected to work in tandem with all teams and departments towards an integrated, personalized customer journey and experience. It’s clear that we’re moving more and more towards digital as the singular channel for managing the entire customer lifecycle, and practices need to be put in place to accommodate this. If you look closely at customer data, it gives insight into who each customer is and what it is they want – allowing businesses to cater processes and offerings to those needs. Customers today are looking for a quick and simple process, but one that is still robust and heavily secured. They want businesses to get to know them and understand their preferences for future purchases, and they want transparency about how their data is being tracked, used and secured. Overall, it’s a simple equation – succeed at secure customer data management and you’ll succeed in the move towards digital, ultimately enhancing customer experience at scale.